The GX350 Real-Time GPS Tracker (2 Pack) lets you track just about anything or anyone in real-time over the Internet. Upgraded from the popular STI_GL300 GPS Tracker, the GX350 features a longer battery life of up to 2.5 weeks and better service coverage with less dead zones. You can use it to keep an eye on the location of your company car, a loved one, or a valuable shipment. Monitor the location of what’s most important to you with the GX350 GPS Tracker. Upgrading to the GX350 GPS Tracker is a great idea if you want a few extra days of battery life. The battery on the STI_GL300 only lasts for 2 weeks, while the GX350 GPS Tracker will last up to 2.5 weeks. This gives you some extra leeway if you’re tracking something or someone for a long period of time. You can rest assured that the device will still be charged even after having been on the road for over two weeks. The GX350 GPS Tracker also offers better service coverage and reliability compared to the STI_GL300. Sometimes when you use a GPS tracker, certain areas on the map can be dead zones, in which finding an Internet connection can be next to impossible. You don’t have to worry about losing a connection with the GX350 GPS Tracker. The device will update its location online even in hard-to-reach rural areas, so you don’t have to worry about losing track of the device. The GX350 GPS Tracker comes with all of the features you’d expect to find on a quality GPS tracking device. You can access all of your tracking data online using your smartphone, tablet or computer. 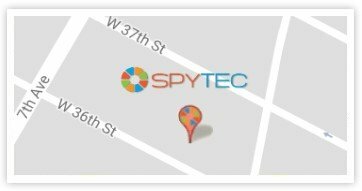 Just log onto the SpyTec GPS tracking website and enter your password. As long as you have a connection to the Internet, you’ll be able to see where your target is in real-time. The device will also send you updates on your smartphone, tablet or computer when your target leaves a certain area. The device comes with Geo-Fencing, which allows you to draw a boundary on the map. As soon as your target leaves that area, a message or an email will pop up on your smartphone, tablet, or computer. You can rest assured that you’ll be notified as soon as your target reaches its destination or if your target wanders too far from home. In order to use the GX350 GPS Tracker, you’ll need to pay a low monthly fee. You don’t have to sign a contract and there are no fees for starting or canceling your subscription. As soon as you’re done tracking your target online, you can cancel at any time and you will no longer be charged a monthly fee. If you decide later on that you need to track something else, you can quickly restart your subscription and cancel as you see fit. Overall, the GX350 GPS Tracker offers excellent reliability and almost no dead zones, helping you stay on top of your target’s location at all times. With a longer battery life, you don’t have to worry about the device dying in the middle of a long trip. From tracking an important asset to keeping an eye on your loved ones, this amazing GPS Tracker has you covered. Get lasting peace of mind with the GX350 GPS Tracker. Products purchased online or from an authorized retailer and under warranty qualify for an exchange with a valid receipt. Warranty service is handled entirely by SpyTec. If SpyTec GPS account remains active longer than 1 year, then warranty for GPS hardware will last for the duration of the account. Warranty Info: 1-Year SpyTec Limited Warranty Products purchased online or from an authorized retailer and under warranty qualify for an exchange with a valid receipt.